Designed for critical astronomical applications, Mira® Pro Ultimate Edition™ includes research-level image calibration, data reduction, visualization, and measurement tools, plus a powerful programming extension language for scripting, algorithm development, simulation, and other computational needs. (Note: This is a 32-bit application. For 64-bit power, see Mira Pro x64). In 1988, Mira™ introduced the world of astronomical image processing to PC users at a time when such work was limited to mainframes and expensive UNIX or DEC workstations. Mira Pro Ultimate Edition™ extends this tradition as the world's most capable 32-bit astronomical image processing application available for Microsoft Windows compatible platforms, providing the professional researcher, educator, or amateur scientist the tools to do professional level work with a blazingly fast, easy to use program. Cutting edge processing and analysis algorithms assure state of the art results for applications ranging from quick-look synoptic work to publishable science — in the lab, office, observatory, or on a student workstation. Mira Pro Ultimate Edition™ starts from Mira Pro and adds the Source Extract ("MExtract") Module, File Event Scripting, a powerful programming extension language for scripting and other custom computational needs. Mira Pro Ultimate Edition™ includes an extensive collection of richly integrated, easy to use tools for image visualization, precision measurement, and data reduction from the user interface. And to take your work to the next level, Mira Pro Ultimate Edition includes our Pro Script™ programming extension language based on the easy to use, fast, and powerful Lua® programming language. Pro Script allows you to create scripts that work with images and other data for scripting repetitive and custom tasks, developing and testing algorithms, creating simulations, and doing countless other programming chores. Also included are hundreds of fast, powerful functions that are easily implemented in your scripts. Note: Mira Pro Ultimate Edition™ is a 32-bit application, meaning that it is limited to 4GB of memory space even running under 64-bit Windows 7/8/10. This also has the benefit of running on 32-bit version of Windows which is commonly installed nowadays in college computer labs. If you use a 64-bit Windows platform and want pure 64-bit computational power unleashed, for working with huge images or many huge images, see the 64-bit version, Mira Pro x64. Mira Pro UE makes it easy to make research quality photometric measurements of any number of stars with any number of standards on any number of images. Doing ensemble photometry, plotting light curves, importing objects from target lists, and reporting results are a snap! 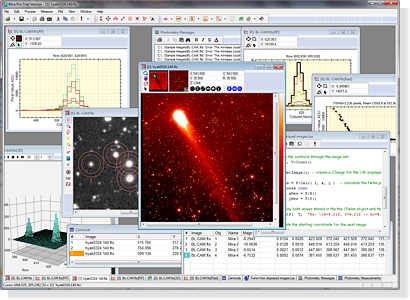 Use Mira Pro UE as a powerful, general-use tool for astronomical research, including areas such as variable star research, exo-planet search, milli-mag level photometry, supernova patrol, minor planet detection & rotation studies, and data mining. Several of the latest features are highlighted below. These are described in the on-line Mira Pro UE User's Guide. File Event Scripting: Execute Mira scripts for processing, analyzing, or measuring data when triggered by a file event. Running as a parallel task (i.e., in a separate thread), you can continue working with Mira while files are being processed. This exciting new feature gives virtually boundless versatility in activities like processing images in real time, monitoring transparency or seeing, plotting light curves in real time, etc. Kwee - van Woerden Solver: Computes time of minimum and uncertainty for variable star data using the Kwee - van Woerden algorithm. Create Synthetic Image command: Create realistic artificial images using all sources of noise and artificial stars. Stars are distributed randomly in position and according to a stellar luminosity function. Useful for teaching and learning about noise effects and for testing algorithms, especially during scripted algorithm development. Mira Pro x64 (native 64-bit advanced version of Mira Pro Ultimate Edition). Educator Bundles: Mira AL x64 site license with Mira Pro, UE, ideal for teaching and curriculum development! Windows 7/8/10, Windows Vista, Windows XP SP3, Windows Server 2003, or a 100% compatible Windows environment on Linux or Mac. Hard Drive Space: 70 MB, including sample images and scripts. Recommended Platform: Windows® 7x64 OS with 8 GB RAM. Even though Mira Pro UE is a 32-bit application, all 32-bit software runs better on 64-bit Windows than on 32-bit Windows.